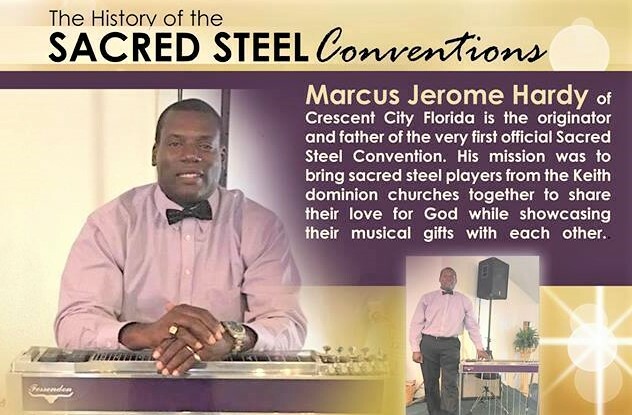 Marcus Jerome Hardy of Crescent City, Florida is the father and originator of the first official Sacred Steel Convention. His mission was to gather sacred steel players from the Keith dominion churches to share their love for God while showcasing their musical gifts with each other on one venue. The first Sacred Steel Convention was a two day event that took place Friday March 31st at 5pm and Saturday April 1, 2000 at 9am. The location was the Bush Auditorium, Rollins College 1000 Holt avenue Winter Park, Orlando, Florida. The guest players were The Campbell Brothers, Aubrey Ghent, Willie Eason, Ted Beard, Calvin Cooke, Lonnie Bennett, and Robert Randolph. The second Sacred Steel Convention was another two day function taking place Friday March 30, and Saturday March 31, 2001. The Sanford civic center in Sanford, Florida played host for the event. 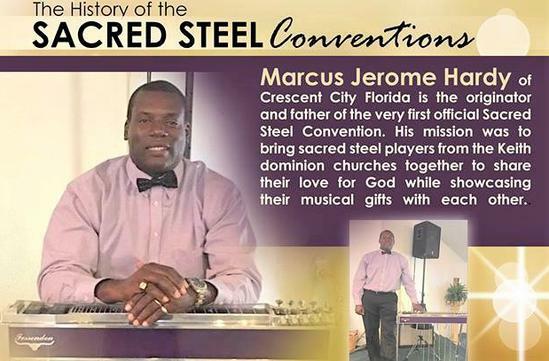 The third Sacred Steel Convention took place at the Travel Lodge, Orlando International Airport, 3835 McCoy Road, Orlando, Florida. This event was co – sponsored by the National Folk Alliance and Crescent City Music, Friday April 5, and Saturday April 6, 2002.